Wow, I haven't posted here in over four years! 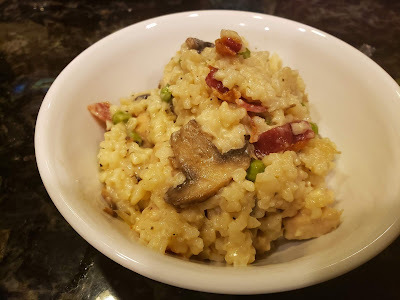 But a friend asked for this recipe and the easiest way to get it to her was to type it up and if I'm going to type it, I might as well put it here. I got an Instant Pot almost two years ago and it is a GAME CHANGER. I love it so much that I bought a 3qt one to be it's companion. Some nights I just use the mini for a side of rice, mac n' cheese or mashed potatoes. Often I'll use it for a small batch of soup. Sometimes I have the biggie and the mini going at the same time. During the summer having the IP so you don't have to turn on the oven is awesome. And now that my kids are in taekwondo 3-4 nights a week, of course right during meal prep time, the IP is a life saver. This is one of those meals. I had a few minutes before class so I made this and then when we got home all I had to do was open up the pot and say, "Dinner's ready!" to two hungry kids who just worked up a huge appetite kicking and jumping and screaming Hee-YA! Turn the IP to the saute feature and saute a diced onion and mushrooms in a pat of butter. When the onions turn translucent add the diced chicken. Saute for a couple minutes to brown the chicken. Add the wine to deglaze the pot. Next add the rice and broth. Stir. Add the butter diced up. Did I really use a whole stick? Maybe not. But probably. Grate the cheese in, salt, pepper and stir. Put the lid on, set to 6 minutes. This is the hard part. Most recipes wills say natural release and I ignore that part. Don't ignore it this time. Natural release for 7 minutes. Then open, stir, taste and see if you need more salt or pepper, or even butter. Add the peas. Now, this is when I had to go to take my kids to taekwondo so after I added the peas, I put the lid back on and had the gauge back to SEAL and kept it on warm. We were gone for a couple hours. When I came back home it was still absolutely perfect. Not dried out, not burnt to the bottom. I added some crispy bacon that I had pre-cooked on the stove and we were set. If you are eating it right away, you may want to thaw your peas before adding them and stir them on the saute feature for a bit. Anyway, enjoy!! !